"When Mattie was small you just couldn't fail, to spot his uniquely curly tail." Mattie does not like his curly tail and tries everything he can to make it straight. It's curliness is part of who he is but it makes him sad and he'd rather not be so unique. His friends though have a plan, to remind Mattie why he is exactly perfect the way he is. 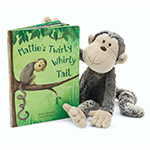 Pair it with Jellycats Mattie Monkey plush (Sold Separately) to make a great Birthday, Baby Shower, or Just Because gift. Mattie Monkey Plush Not Included, Sold Separately.